As regards presents, this one was way up there. 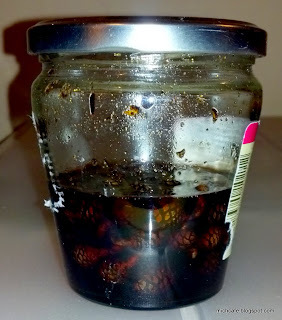 I don’t exactly know what it is, except that it’s a bit of culinary heaven in a jar! 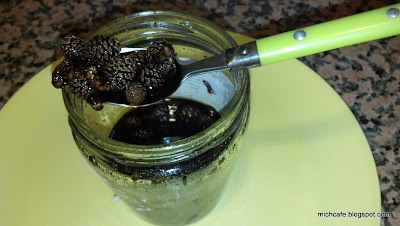 My friend and colleague Marina usually supplies me with all kinds of honey, mainly from her native Uzbekistan. 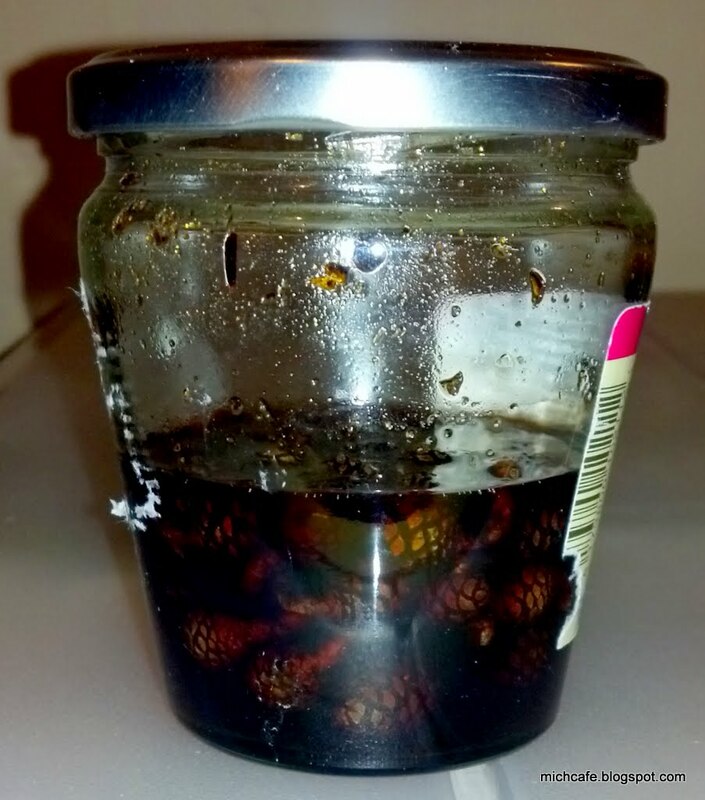 But this time, she presented me with a small jar that looked like berry conserve or jam. Marina was in a hurry. She just told me a friend got her this from Italy and she wanted me to taste it too. “Enjoy,” she said while running off to get to work on time. 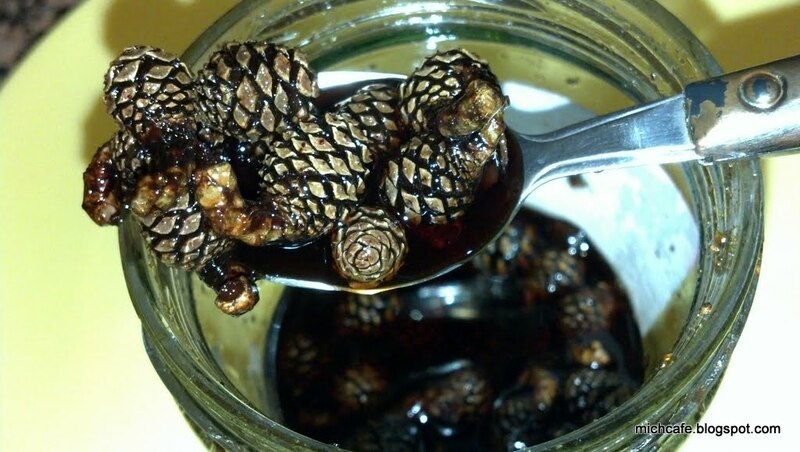 When I got home that night and opened the lid, I discovered it was not berries in the red thick syrup, but miniature pinecones! I tentatively dug in with a spoon, not sure whether I was supposed to eat them or not. But when I did, I was blown away. 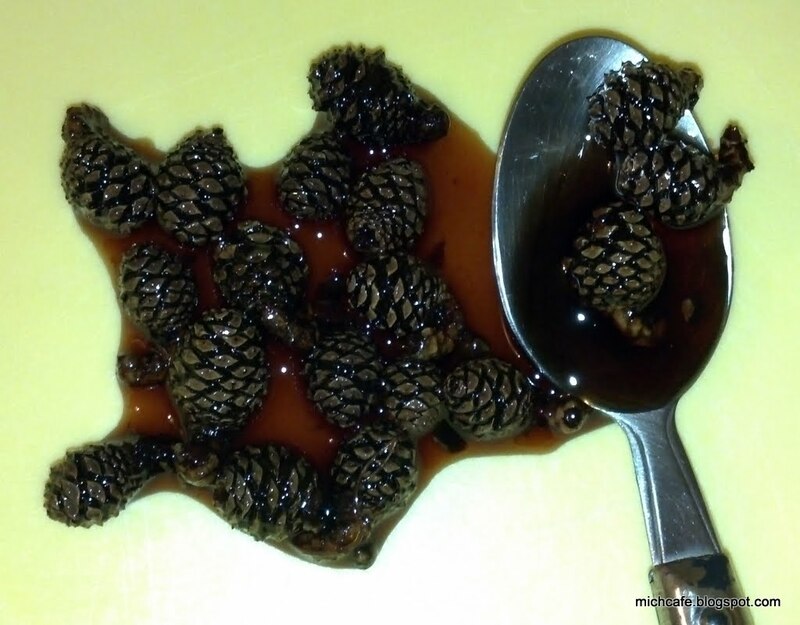 I was actually eating miniature pinecones in syrup. It was like taking a walk in the pine forests of Lebanon – tasting, smelling and hearing the forest with every chew. It is so delicious and special that I kept digging my spoon in for another mouthful. Luckily, I remembered to stop in time to have some left to take these pictures. I am more of a city person. Pine forests remind me of being sent to Lebanon’s mountain resorts of Aley and Brummana when I was a child. I came to hate them for being exiled for the hustle and bustle of Beirut. Pine forests and the continuous chirp of crickets surrounded both houses where I used to stay. After the first taste of my delicacy, I asked one of my favorite food bloggers, Sally Prosser of My Custard Pie, if she knew anything about my little pinecones. She did not. And for the first time, Google let me down too. There is a lot about miniature pinecones, but for decoration. So, I really don’t know what they are. 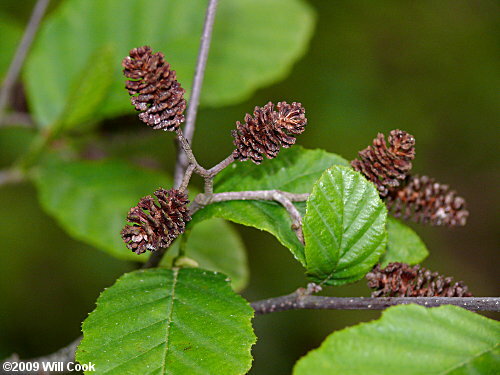 Are they from a pine tree, a Hemlock tree or a Hazel Alder? I have no idea. More people around the world are refugees or internally displaced than at any time since 1994, with the crisis in Syria having emerged as a major new factor in global displacement. The UN High Commissioner for Refugees (UNHCR) annual Global Trends report released yesterday, ahead of World Refugee Day, shows that as at the end of 2012, more than 45.2 million people were in situations of displacement compared to 42.5 million at the end of 2011. This includes 15.4 million refugees, 937,000 asylum seekers, and 28.8 million people forced to flee within the borders of their own countries. The report does not include the rise in those forced from their homes in Syria during the current year. Significant new internal displacement was seen in the Democratic Republic of Congo and Syria. A full 55% of all refugees listed in UNHCR's report come from just five war-affected countries: Afghanistan, Somalia, Iraq, Syria and Sudan. Afghanistan remained the world's biggest source of refugees, a position it has now held for 32 years, with 95% of Afghan refugees located in either Iran or Pakistan. Somalis were the second biggest group of refugees in 2012, followed by Iraqis. Syrians were the fourth biggest group. The figures do not, however, reflect the additional one million people who have fled Syria in the last six months. 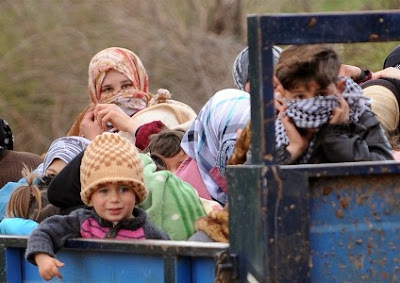 According to the UNHCR report conflict in Syria has "forced 647,000 people to flee mainly to neighboring countries. This was the largest annual exodus by a single refugee group since 1999, when more than 867,000 people fled Kosovo." The number of internally displaced persons is at the highest level in more than 20 years, with the war in Syria leading to 4.25m Syrians being internally displaced. The UN says if current trends persist, a further two million people will have left Syria by the end of this year. It also found that developing countries now hosted 81% of the world's refugees, 11% more than a decade ago. Children below age 18 make up 46% of all refugees. In addition, a record 21,300 asylum applications submitted during 2012 were from children who were unaccompanied or separated from their parents. This is the highest number of unaccompanied or separated children that UNHCR has recorded. "These truly are alarming numbers. They reflect individual suffering on a huge scale and they reflect the difficulties of the international community in preventing conflicts and promoting timely solutions for them," said António Guterres, UN High Commissioner for Refugees and head of UNHCR. The report highlights worrisome trends, including the rate at which people are being forced into situations of displacement. During 2012 some 7.6 million people became newly displaced, 1.1 million as refugees and 6.5 million as internally displaced people. This translates to a new refugee or internally displaced person every 4.1 seconds. "Each time you blink another person is forced to flee," Guterres said. Of 10.5 million refugees under UNHCR's mandate -- a further 4.9 million Palestinian refugees fall under the mandate of its sister-agency, the UN Relief and Works Agency (UNRWA). A refugee will always yearn to return. The key to the abandoned home is often the symbol of that hope. My uncle, until he died before returning to Palestine, kept the key to his Haifa home hanging next to the front entrance of his Beirut residence. He would bring the key down before Sunday lunch to make sure it wasn’t rusty or anything. World Refugee Day is held every year on June 20 to recognize the resilience of forcibly displaced people throughout the world. It was established by the United Nations to honor the courage, strength and determination of women, men and children who are forced to flee their homes under threat of persecution, conflict and violence. This year, UNHCR continues its award-winning "1" campaign with its first ever personal fundraising. 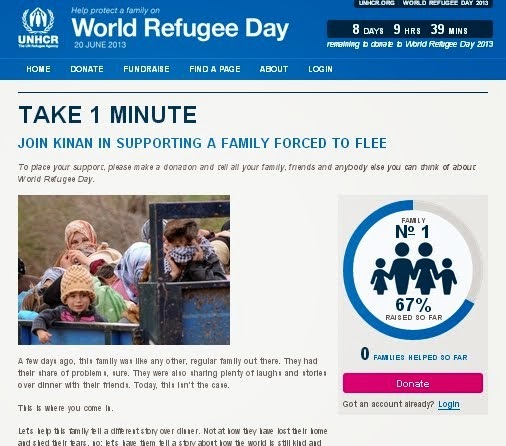 It asks us to Take 1 minute to support a family forced to flee. On World Refugee Day 2013, the focus is on the impact of conflict on families through the theme of “1 Family Torn Apart by War is Too Many.” The spotlight is also on ways of helping those who are forced to flee to find safety, regain hope and rebuild their lives. In 1 minute, a family can be torn apart by war, a child can be separated from his or her parents and a lifetime of work can be destroyed. Yet in 1 minute, the world community can also act -- reuniting a family, protecting a child, providing shelter, UNHCR says. Often classified unfairly with economic migrants, refugees flee their country not for economic gain but to escape persecution, the risk of imprisonment and threats to their lives. They need a safe haven where they can recover from mental and physical trauma and rebuild their hopes for a better future. The intolerance that is often at the root of internal displacement and refugee flows is also present in some of the countries refugees flee to. Instead of finding empathy and understanding, they are often met with mistrust or scorn. The UN General Assembly, on 4 December 2000, adopted resolution 55/76 where it noted that 2001 marked the 50th anniversary of the 1951 Convention relating to the Status of Refugees, and that the Organization of African Unity (OAU) had agreed to have International Refugee Day coincide with Africa Refugee Day on 20 June. The General Assembly therefore decided that 20 June would be celebrated as World Refugee Day. 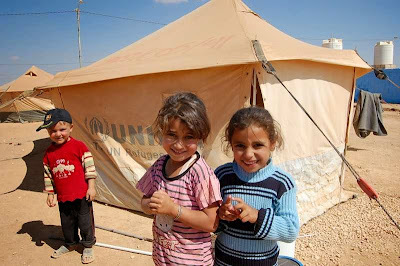 Ahead of the G8 meeting in Ireland earlier this week, Carolyn Miles, President and CEO of Save the Children, made an appeal to world leaders to save the children of Syria to coincide with World Refugee Day. 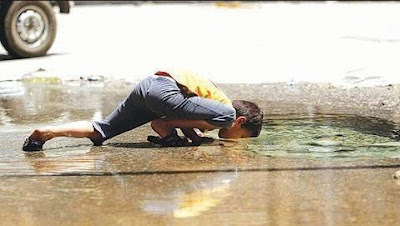 “Time is running out for millions of children across Syria,” Miles said. “The G8 leaders must send a strong signal to the world that the appalling humanitarian crisis in the country and region is a global priority. Aid agencies like Save the Children can only reach 10% of people we aim to help inside Syria. “We urgently need better access; we know that children are being tortured, have little medical help and have witnessed family members being killed in front of them. Families are resorting to digging for food. Becoming a refugee is not a choice that is made easily or willingly. As such, refugees deserve and should be accorded the respect and dignity to rebuild their lives. One of the greatest tragedies of the Syria war – other than the hundreds of thousands of Syrians killed, maimed, disappeared, detained and tortured, the economy’s collapse and the destruction of between 60 and 70 percent of the country -- is the growing numbers of refugees and internally displaced persons (IDPs). More heartrending is the fact the figures will keep growing. Already, over 1.6 million people have little prospect of going back to their Syria homes in the foreseeable future. According to UNHCR, one million Syrians took refuge in Lebanon, Jordan, Turkey, Iraq and Egypt in the six months since December 2012. “With little prospect of being able to safely return to their homes in the short term and growing hardship in host countries, Syrians face desperate circumstances. At the same time, the governments of the region hosting Syrian refugees and the humanitarian community face an increasingly challenging and complex humanitarian crisis which, beyond refugees' immediate protection and assistance needs, threatens the balance of the entire region,” UNHCR says. Apart from the 1.6 million people who fled to neighboring countries, some 4.25 million are believed to be displaced within Syria and many more are affected by the war. What is so baffling, considering the figures, is the apathy of the key international players, chiefly the United States and the European Union countries. Based on arrival trends since the beginning of the year, UNHCR estimates the number of Syrian refugees in need of assistance across the region may reach 3.45 million by year-end 2013. They will be hosted in camps and, for the most part, in local communities. In an effort to grapple with what might become the largest refugee crisis ever, the United Nations is asking for a record-breaking $5.1 billion in humanitarian aid for Syria and neighboring host countries. Each refugee has a tale of horror to cope and live with forevermore. 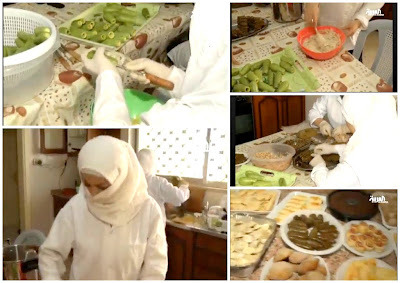 With the help of British charity Syria Relief, a group of women in a Syrian refugee camp in Jordan is coping by sewing and cooking in a DIY workshop. Each of the women at the workshop is as busy as a bee. Their eyes hide a thousand tales but they only have time for work – all 20 of them embroidering and cooking to support refugee families and their own. Alarabiya TV anchor Rima Maktabi toured the camp in Jordan and met the women at their improvised workplace. When they talk, it is mostly about recollections and the loved ones they lost or left behind. Umm Imad seems weighed down by her 60 years. She embroiders clothing to support family and relatives. Her son was killed in Syria. After burying him, she fled to Jordan. 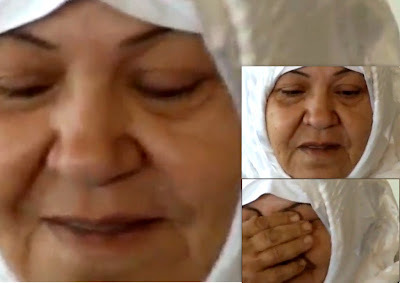 The Syrian women in the Alarabiya video cover their faces and hide their fear. Even in Jordan, they feel the need to protect their own identity in order to save from harm relatives who stayed behind in Syria. UK-based Syria Relief tries to alleviate the Syrian refugee burden. It set up the women’s workshop to raise money from the sale of its output. The money goes to those in need. Numerically, this is the largest refugee crisis in the history of the modern Middle East. In Jordan, more than 100,000 Syrians live in the teeming Zaatari refugee camp, set up in July 2012, now the second largest in the world. But the vast majority has settled in cities and towns around the country. Syrian refugees can now make up fully half the population of some northern cities. As of mid-January 2013, the UN has registered almost 176,000 refugees in Jordan. The Jordanian government estimates 250,000 have entered the country. In Lebanon, some 510,000 refugees already make up more than 10 percent of the population. Lebanon has elected not to build refugee camps. So the influx is straining the country's decrepit infrastructure and overwhelming its border towns and villages. Then there is Turkey. Nearly 400,000 refugees fled to government-funded camps early in the Syrian civil war. According to a study by Salam Kawakibi, a Syrian political scientist based in Paris, there are some five million internally displaced Syrians within their own country. The majority can today be found in or near Damascus, Aleppo, Homs, Deir Ezzor and Idlib. There are currently almost 70,000 refugees registered with the UNHCR in Iraq. The vast majority reside in the Kurdistan province of Duhok, mostly within Domiz camp -- an autonomous region in the far north of the country. Syria Relief, which is helping refugees with mini projects, was set up in September 2011 to provide help and support to Syrian families in need, in and outside Syria. Syria Relief is a non-political, non-denominational, non-governmental organization, coordinates a number of charitable activities taking place in the UK to provide help and support to Syrian families and individuals in need, in Syria and outside it, irrespective of religion, geographical location, or political persuasion. The women’s sewing and cooking will certainly help make a difference for some of the refugees around them. But they will be far from the $5.1 billion needed in humanitarian aid. Americans spend on ice cream in 32 days! Will the world be up to the humanitarian aid challenge or will the Syria war go down in history as the point when humanity lost its meaning? 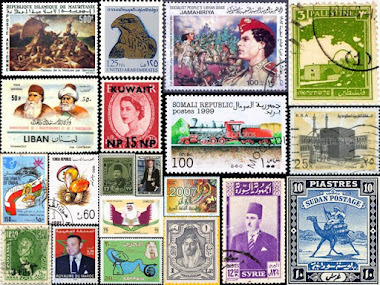 Today, Thursday, is a public holiday in the UAE and most of the Gulf and Middle East. Many have been counting down to the long weekend (although I will be working). But very few people I asked knew why we were off work, so I decided to find out. 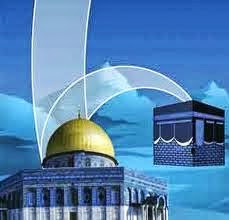 It is Al-Isra’ wal Mi'raj -- الإسراء والمعراج -- an important observance day in the Muslim calendar. It falls on 27 Rajab in the Hijri calendar, corresponding to 6 June this year. It marks the two parts of a physical and spiritual night journey that, according to Muslim tradition, the Prophet Muhammad (PBUH) took during a single night circa the year 621. I found a brief sketch of the story in Sura 17 Al-Isra of the Holy Quran. Other details come from the hadiths or supplemental writings about the life of the Prophet. 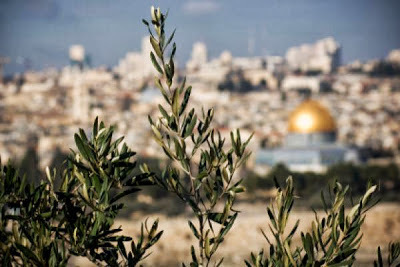 Some of the disbelievers went to Abu Bakr as-Siddiq (one of the senior companions – Sahabi -- and father-in-law of Muhammad and the first Muslim Caliph following Muhammad's death). 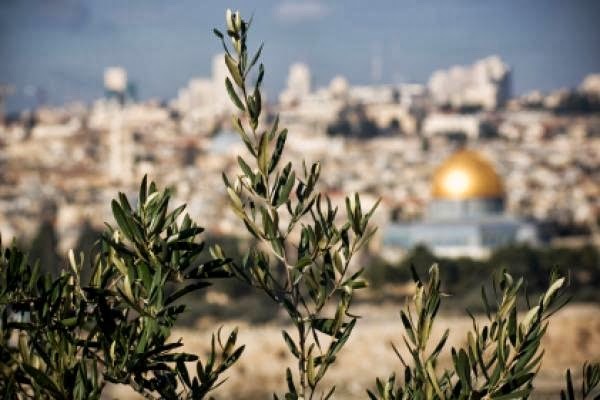 Exalted is He who took His Servant by night from al-Masjid al-Haram to al-Masjid al-Aqsa, whose surroundings We have blessed, to show him of Our signs. Indeed, He is the Hearing, the Seeing. Have a wonderful day and enjoy the long weekend. My fingers immediately went to my keyboard to answer, then I got thinking there would be so many more than could be listed in 140 characters. I didn’t notice any replies, at least on the timeline Mher and I share. I have been mulling it over since and kept adding to the list. There are so many beautiful things. It was a good exercise to get away from all the news of violence and drums of war and focus on appreciation. My immediate thought went to places, but although well traveled, it would be presumptuous in such a large universe. What do you consider the most beautiful thing in the world? I have disabled comments on Mich Café due to the large amount of advertising spam. 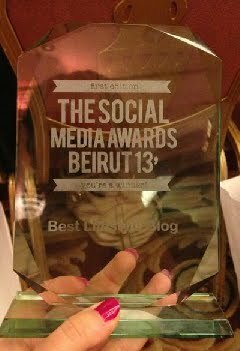 But you can contribute your “most beautiful things” on Facebook or Twitter.